Opuscula Selecta hasn’t seen an update in awhile, but that doesn’t mean that the Junius Institute staff haven’t been hard at work. In fact, a great deal has happened over the last year that has kept us involved in projects and publications in Europe, Asia, and America. In the coming days I’ll be posting some regular updates about what staff members have been up to, highlighting especially their Reformation-related projects. So stay tuned! Meanwhile, the Post-Reformation Digital Library continues to expand, now covering over 5,700 authors. In fact, we frequently digitize materials for scholars in Europe, particularly music scores. We do have a limit per month per requestor, and how long it takes is dependent on what other projects are being worked on, vacations, etc. It can take anywhere from a week to 4 or more weeks. The University has plans to digitize the majority of the materials in its collections. This is why we can agree to not charge for the service, we are going to digitize it anyway, its just a question of when it gets in the queue. A patron request moves an volume up to the front of the line. I have heard similar anecdotes elsewhere. So when in doubt, it doesn’t hurt to ask. Google Books, by the by, seems to still have a mechanism for suggesting corrections or rescans for the numerous problems that appear in their books. The older method was convenient, but seems to have been phased out in the new interface. Now, if you try to click on “Help” when viewing a book page (available under the “gear” dropdown menu on the top right when navigating in a book), there is a link under “Help” for “Known Issues – Books,” under which there is another set of menus under “Book quality issues.” If you click on that, you can click on “Book has missing pages, typos, or other kinds of error,” which recommends reporting the error(s) via a form. The form doesn’t seem to work, however. You can get to this page from other places on Google Books, but it seems to be intended for authors and copyright holders. Also, I recommend using the report error features on Google Books judiciously. Google has been known to pull the entire book out of digital circulation while addressing the reported error. So make sure you’ve gotten whatever copy you need to use in the meantime if it is a source that you want to have access to while any bad scan issues are being addressed. I had the privilege yesterday of attending the successful defenses of two Ph.D. candidates at Calvin Theological Seminary under the supervision of Dr. Richard Muller, senior fellow of the Junius Institute and PJ Zondervan professor of historical theology at CTS. These two projects are fine examples of the importance of dissertation research for a variety of reasons, including those highlighted previously by David Sytsma. A number of dissertations from the CTS program are available here. 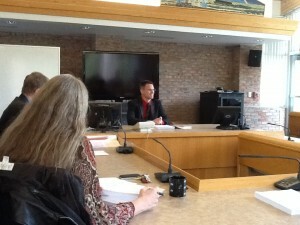 The first dissertation defense yesterday was by Ted Van Raalte, a contributing editor at the Post-Reformation Digital Library and newly-appointed professor of ecclesiology at the Canadian Reformed Theological Seminary. In a dissertation titled, “Antoine De Chandieu (1534-1591): L’un des pères de la scholastique réformée?” Van Raalte explored a number of sources, including Chandieu’s Locus de Verbo Dei Scripto, adversus humanas traditiones, theologice et scholastice tractatus (Bern: Le Preux, 1580). Visit Chandieu’s page on PRDL for other easily accessible digital sources by this significant French reformed figure. One of the aspects of the digital age that is especially exciting is the ability to interact not only with source texts but to recreate early modern contexts. The Virtual Paul’s Cross Project is particularly fascinating. The project is conceived as “a digital re-creation of John Donne’s Gunpowder Day Sermon” at Saint Paul’s Cross in 1622. The project is multi-sensory, including a 3D digital model as well as an acoustic model and the full sermon from a variety of perspectives. Check out too the process of developing the sermon script itself and the text history. Take some time to explore the project! There’s also a nice overview provided over at Early Modern Online Bibliography. We have all seen movies or read novels where the hero or villain is just one step ahead of the authorities. At barely 20 years old, Junius became a minister to a Reformed conventicle in Antwerp. According to his own journal entries in November and December 1565, after presiding over a clandestine Reformed service among many leading Dutch nobility (Nov. 2), Junius was present for a key conversation involving a conspiracy to take Antwerp by military force by December 3, a plot only dissuaded by Orange himself in favor of more diplomatic means to secure toleration and prevent the arrival of the extraordinary inquisition (ordinary being local by the bishops, extraordinary commissioned by the pope). The confederacy of nobles eventually produced a compromise petition that was presented to the Duchess Margaret of Parma in April 1566. The petition was signed by approximately 400 noblemen throughout the Netherlands–correction 400 noblemen that could raise, by some estimates, 15,000 heavily armed troops. This brief excerpt from Gerard Brandt’s The History of the Reformation in the Low Countries (1720), details how Junius barely escaped arrest in early 1566 for writing a letter to the King of Spain regarding religious conscience. Once it was discovered that the author was a French Reformed pastor operating clandestinely and illegally in Antwerp, the Marquis of Antwerp enlisted the aid of an artist/spy. The spy would infiltrate Junius’ conventicle, gain his trust, and eventually return a sketch of Junius’ likeness that he might be arrested and his quarters searched. The artist even tailed Junius back to his lodgings. You can read the excerpt to find out how this caper ended. What a good reminder to historians and theologians how much cloak and dagger surrounded issues of freedom of conscience and toleration in the 16th century, even for a 20 year-old pastor.